Srixon Z u85 Hybrid 29° 6 Hybrid. Steel Shaft - N.S. Pro Tour 105 Stiff S Flex. All single pieces (drivers, fairway woods, hybrids, single irons, wedges, putters. Headcover Not Included / Tool Not Included. ). SrIxon Z585 Irons 4 Through PW RH Stiff!! Up For Sale is a Preowned set of SrIxon Z585 Irons 4 Through PW RH Stiff. Nippon 105 shafts in stiff Flex Irons never played on course. Hit at range 3 times. Irons are in Awesom Condition with normal wear on bottom and face of clubs. 4, 5 and 6 irons never hit. Standard length and lie. Up graded Winn Dri Tac grip!!! No international shipments. No PO box shipments. No returns. New ListingSrixon U65 3-20° Utility Driving Iron - Tour AD-95 Stiff! Srixon U65 3-20° Utility Driving Iron. Flex: Stiff. Shaft: Graphite Design Tour AD-95. Used Srixon Z-U65 18* 2 Iron Utility Iron Miyazaki 7s Graphite Stiff Flex Shaft . Condition is Used. Shipped with USPS Priority Mail. 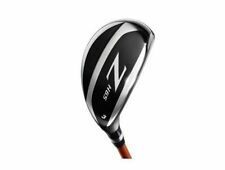 Srixon ZF65 15 3 Fairway Wood. Graphite Shaft - Miyazaki Tour Issue Regular R Flex. All single pieces (drivers, fairway woods, hybrids, single irons, wedges, putters. Grip - Golf Pride. ). Right handed Srixon Z U85 18 2 Hybrid Utility. The club has a factory installed UST Recoil F4 Stiff flex Graphite shaft and has a Srixon grip. All standard specs. Srixon Z565 4 & 5 iron Project X Rifle 6.0. Condition is Used. Shipped with USPS Priority Mail. These clubs are gently used (2 rounds) and have upgraded rifle 6.0 stiff shafts. Brand new lamkin grips. Dynamic Gold S300 Stiff Steel. AW Loft 51 Degree. Golf Pride Tour Velvet Std Grip. Srixon Z U65 forged 3 iron. Miyazaki 7s graphite shaft. Used in 4 rounds, struck about 18 golf balls. 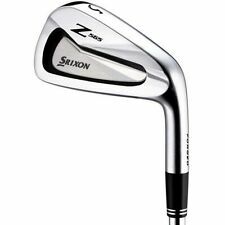 SRIXON ZU85 3 20* Recoil 95 F4 New. Condition is New. Shipped with USPS Priority Mail. Average used condition Srixon F45 17 degree fairway wood. Club features Kuro Kage shaft in stiff flex. Sorry, no headcover or wrench. Custom built tour van srixon zu85 2 iron 1 degree strong 17* 2 degrees upright and .75 inches over standard. Club has only been hit about 5 times on the range.New Srixon ZU85 18* 2 Hybrid 2h Utility Iron UST Recoil F4 Stiff Graphite z U85. Shipped with USPS Priority Mail. Srixon 4-pw i-701 Tour. Stiff iron set. Irons are average with marks on irons. Faces are all in relatively good shape. Nice cavity back irons for an above average player. 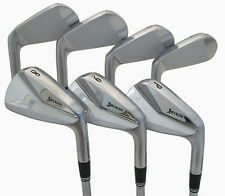 Up for sale is a very lightly used set of Srixon Z785 5-P Irons. They are shafted with Nippon Pro Modus 120 X-flex, 1/2” over standard, standard loft & lie. They are MINT 9.5/10! Only played 2 rounds! Golf pride standard MCC Black grips. Check my feedback and bid with confidence, you won’t be disappointed!!! Srixon Z U65 18° 2 Hybrid Utility iron. Graphite shaft - Miyazaki Tour Issue 7s Stiff flex. Golf Pride Tour Velvet 360 Grip (Standard). All single pieces (drivers, fairway woods, hybrids, single irons, wedges, putters. ). srixon z565 irons 4-Pw Nippon Modus3 X-stiff. MCC Plus 4 Grip. Great Condition! Used Srixon Z745 Forged Iron Set 4-P (4.5.6.7.8.9. The single club photo is the 6 iron to show a reference to the length of the iron set. All single pieces (drivers, fairway woods, hybrids, single irons, wedges, putters. ). Srixon Z U85 Hybrid 20° 3 Hybrid. Graphite Shaft - Mamiya Recoil Stiff S Flex. All single pieces (drivers, fairway woods, hybrids, single irons, wedges, putters. Headcover Not Included / Tool Not Included. ). Srixon u45 18 Degrees. Excellent condition,used a handful of times. Graphite Shaft Reg. Mitsubishi Kurokage. Can be used as a driving iron. Shipped with USPS Priority Mail. Up for auction is a Srixon Z965 Iron Set 4-PW KBS TOUR Regular Shafts EXCELLENT CONDITION. Condition is very lightly Used. Shipping will be $12 for UPS ground insured within the continental US. Thanks and good luck. 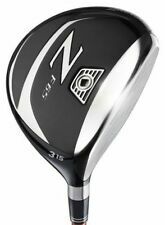 Srixon ZF85 15 3-wood; X-Stiff Fujikura Pro 73 shaft, new Lamkin full cord grip. Srixon ZU85 20 3 Hybrid 3h Utility Iron. Excellent Condition. Standard length and lie. 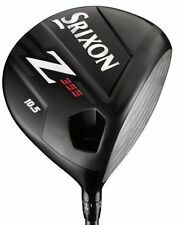 Srixon Z H65 22° 4 Hybrid. Graphite shaft - Miyazaki Tour Issue 7s Stiff flex. Golf Pride Tour Velvet 360 Grip (Standard). All single pieces (drivers, fairway woods, hybrids, single irons, wedges, putters. ). Srixon Z 355 Iron Set 4-aw With N.S. Pro R- Flex Steel Shafts. Grips are Winn dritac in very good condition. Love the clubs but must sell them. Condition is Used. Shipped with USPS Priority Mail. Light surface scratches on sole and face. Item close to new condition. No head cover. They must be unused and still in original plastic. Warranties are only valid in the US. Srixon Z765 Iron Set(4-AW) .Nippon NS Pros Modus3 Tour120 Stiff-flex. Condition is Used. Normal bag chatter. Overall face condition is very good. Lamkin Crossline grips in very good condition. Shipped with FedEx Ground or FedEx Home Delivery. Condition: 8 out of 10 - Very Good: These clubs/iron sets have been played in an appropriate fashion. The wear is typical for an item of similar model/age and has been well taken care of to date. We cannot use other. Rare Condition Srixon Z745 (3-PW) Iron Set These heads are still in the bags of many Srixon pro’s!! 4-PW shafted with hot new big $ upgrade True Temper Elevate Tour Stiff Flex! This was a new shaft build not pulls 3 Iron is still New in wrapper and has a stock DGS300 shaft Condition of the 4-PW is Used but in a rare excellent condition with minor bag chatter (see detailed pics) 4-PW is built of a 37.75 inch 5 iron and standard loft and 1 flat lie 4-PW has excellent condition Golf Pride Tour Velvet Grips Standard size and logo down Shipped with USPS Priority Mail. 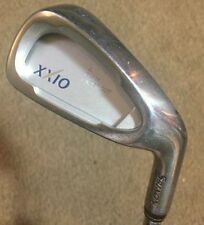 Srixon U65 3-20° Utility Driving Iron - Tour AD-95 Stiff!